Strange title; check. Irregular song structures; check. Crazy time signatures; check. Yes, this is prog rock alright. 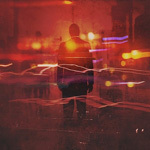 Riverside's return with Anno Domino High Definition is a prog record through and through, but is it all that fans hoped for? Short answer, perhaps. The album is what most have come to expect from Riverside. It's almost completely synthesizer and/or bass driven, guitar delivers solos that are all over the place and vocals are alright. Bass is great throughout the album and even has a solo in 'Driven to Destruction'. Guitar is almost always fantastic, only with a few very minor slipups. Vocals aren't great. Vocal variation is barely ever used and when it is, sounds unnatural. Most of everything a listener will hear on this album is synthesizer. It's well done and if you like that style of music you'll love songs like 'Egoist Hedonist'. Songs range from six to twelve minutes for the optimal progressive track but the album only has 5 songs. The main weakness of the album are the progressive song structures the band uses. It works on 'Hyperactive' and 'Hybrid Times' but not on 'Driven to Destruction' and 'Left Out'. Listener who can look past this however will enjoy Anno Domino High Definition. Anno Domino High Definition is not Riverside at their best. However, fans will still find something to like and other listeners might as well.